A few years ago I broke off a front tooth eating an English muffin that was as hard as a rock. When I took it out of the freezer, I defrosted it in the microwave too long. That's how it got that way. I made one for myself and one for my girlfriend. I ate mine, but she said, "This is too hard for me." "Here," I said, "I'll eat it" and I promptly broke off my tooth. The dentist removed the part of the tooth that was hanging by a thread which was most of the tooth down to the gum line and gave me a flipper. I think the flipper cost $300. This was a while back and I don't remember what alternatives the dentist gave me, but I'm sure they were all expensive so I decided to keep the flipper as a permanent solution. This lasted a few years; then the flipper broke. I had it repaired; then it broke again. Finally, I gave up on the flipper and decided to seek a permanent solution. The dentist I was going to in San Diego suggested a bridge cap as a more reasonable alternative to an implant. (Actually, I had gone to two dentists before that including the one who gave me the flipper and neither of them had proposed a reasonable solution.) What they would do for the bridge cap is grind down the two adjacent teeth, cap them and then those caps would support a third cap over my missing tooth. First they would extract what remained of my missing tooth below the gum line. This solution would cost $995. per cap or $2985. plus the extraction. I forget how much that was. And this was with my Secure Horizon high option dental insurance! So two front teeth would be destroyed, and one wouldn't be rooted in anything. And the dentist said she didn't know how long it would last. After considerable thought and seeing some ads in the Reader which said that implants in Tijuana could be had for $1500., I decided to look for a dentist in Tijuana. I had been thinking about this for some time as a more economically feasible alternative to US dentistry which had been costing me more and more as time went on, and I was getting less and less satisfied with the quality and the way they treated patients as well as all the subterfuges surrounding how they dealt with insurance. Dental insurance was pretty much of a joke anyway as the dentists always seemed to find a way around it either by shorting the service or charging you for additional items the insurance didn't pay for. As was my wont, I googled "dentistry in Tijuana" and checked out somewhat thoroughly what was available which was a lot. In fact I devoted an afternoon to it. A lot of dentists had websites, and a ton of information was available. I had several criteria: qualifications and background of the dentist; quality of the website; location and appearance of the dental office. Some of these criteria are somewhat superficial, I admit, but I wanted a dentist with a nice office in a good neighborhood, not somebody who worked out of his house in a bad neighborhood. I finally settled on Baja Oral Center. 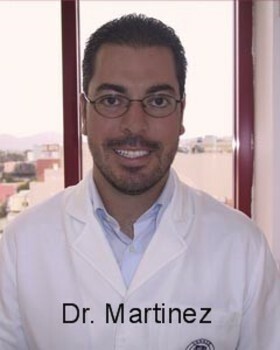 I was impresssed with the qualifications of Dr. Martinez who did the dental implants. I called a local San Diego number (they have an 800 number too) and set up an appointment with Dr. Martinez to see about a dental implant. Everyone in the office speaks fluent English including the office manager and phone answerer, Berniece. They cover all the bases at Baja Oral Center. The general dentist there is Dr. Garcia. I was impressed with his credentials too. Their equipment is the latest and most modern. And their offices and waiting rooms are immaculate. The day of my appointment at 11 AM, I took the San Diego trolley from downtown. I allowed an hour and a half to get down there. My plan was to take the trolley to San Ysidro, walk across the border, then get a taxi to Jose Orosco St. where the offices are located in the Plaza Pacifico building, a relatively recently constructed high rise. It actually took me an hour and fifteen minutes including a fifteen minute walk to the trolley station from my apartment. The taxi ride cost "cinco" dollars and took less than five minutes. The offices are located in the Zona Rio section of Tijuana, near Paseo de los Heroes and a huge modern shopping mall. There's a large statue of Abraham Lincoln (among others) nearby on Paseo de los Heroes. I went up the elevator to the fourth floor and found the Baja Oral Center office. It seemed like the whole building was devoted to doctors and dentists. I met with Dr. Garcia who checked me out first, had a panoramic Xray which cost $27.00, and then Berniece escorted me up to Dr. Martinez' office in the penthouse. Dr. Martinez' office is truly stunning with fantastic views. Everything about this building and the offices I've seen is first class. Much nicer than most US dental offices that I've been in with much better "wall-of-glass" views. By the way Dr. Garcia, Dr. Martinez and Berniece all speak perfect English. I told Dr. Martinez I was interested in an implant. As he examined me, he pulled and tugged on what was left of my front tooth. I couldn't figure out what he was doing. Finally, he said, "I could give you an implant if you want it, but a better and less costly solution would be to put a post on your tooth since you still have part of one there and then a crown." Dr. Martinez pointed out that I had already had a root canal in that tooth so there should be no pain or complications. Why waste a perfectly good root canal? He would do some minor gum surgery first in order to expose more of the tooth and Dr. Garcia would do the rest. The total cost would be $850 including the gum surgery and a gold crown (gold on the inside, regular looking tooth on the outside). It would be a better solution than the bridge cap or the implant and would cost me $2135. less! We set up an appointment for the following week. I wondered why no US dentist had proposed this solution. Was it because it was more labor intensive and less lucrative than the solutions they proposed? As it happened, I had an appointment the next day with my San Diego dentist for scaling and root planing, otherwise known as deep cleaning, for two quadrants of my mouth. My former, former dentist had told me I needed this 4 times a year. Then when I changed from Blue Cross to Secure Horizons (when I went on Medicare) the dentist told me I didn't need it at all. Blue Cross didn't cover this procedure at all but Secure Horizons did with a $50.00 copay. Seemed strange to me that one dentist would recommend it so often when it wasn't covered by insurance, and then the next one would not recommend it when it was covered by insurance. But they told me they would perform it if I wanted to pay the full freight! I guess he was fulfilling his role as gatekeeper for Secure Horizons! That's why I changed dentists again. This time they were pleased to do the deep cleaning under the insurance. I was prepared to pay the $100.00 copay for half my mouth, and then there would be a follow-on appointment for the other half. The dentist jabbed me, and I mean jabbed, several times with novacaine, no topical anesthetic first (as a contrast Dr. Martinez applied a topical and I never even felt the novacaine needle), then proceeded to work on the two quadrants for less than an hour. This is something else I had noticed with US dentistry. When it was an insurance prodcedure, it always took far less time than when you were paying out of your pocket. I guess this is how they made up for the lesser payment from the insurance company. When I got out to the desk they told me the bill was $430! This included my $100.00 copay which I expected and then two charges of $55.00 each for an "unspecified perio procedure." There were also five $44.00 charges for arestin which is something they stick down below the gum line which is supposed to heal infection. I had agreed to the arestin, but they had not told me it was $44.00 a shot! It just took her seconds to put each one in so I felt the cost was ridiculous but I had agreed to it. Fool me once... but what really bothered me was the two $55.00 charges for an "unspecified procedure." I guess they are so brazen they just blow off the expected copay and charge you whatever they want. Right there I decided that I was going to have all my dentistry needs taken care of in Tijuana and not just the big items. I had contemplated having my routine work still done under my insurance in San Diego, but I came to the conclusion that dental insurance is a joke, and dentists would do whatever they had to do to work around it and still charge you exhorbitant prices or give you less than the standard service in terms of their time. I called and canceled my second $400. plus dental appointment with my San Diego dentist, and after three visits to Dr. Garcia I had my front tooth back again with which I'm very happy. I guess I had gone toothless for about three months, but I'm happy with the final result and what I paid for it. By the way Dr. Garcia worked on me for about two hours putting in the post and the temporary tooth. Before that Dr. Martinez did some minor gum surgery to expose the tooth more. No separate appointments necessary for the two procedures! And I never had any pain during or after the procedure. Maybe the time it took for this procedure is why no San Diego dentist recommended it although I do believe it's preferable to either the bridge cap or the implant and far less costly, but it was labor intensive and US dentists want you in and out of the chair as quickly as possible. I credit Dr. Martinez' honesty for the less expensive diagnosis when he could have given me an implant and charged me a lot more, and Dr. Garcia's and Dr. Martinez' hard work for a very reasonable charge compared to the time they put in. Finally, they did all this for over $2000.00 less than what the San Diego dentist had proposed! Subsequently, I took my daughter and two granddaughters to see Dr. Garcia. My granddaughters were worked on by Dr. Lizeth Fajardo, who specializes in pediatric dentistry, and Dr. Garcia saw my daughter. My daughter needed to see another specialist to get braces even though she's 36. She has some serious problems, but will save some serious money by not going to a San Diego dentist for her dentistry needs. Dr. Lizeth did a great job with the granddaughters. I found that all the dentists and assistants in Dr. Garcia's office were polite and kind and seemed to really care about our welfare as opposed to the arrogant and uncaring attitudes I found with some dentists and some office staff in San Diego. In fact some of the office staff I dealt with in San Diego were downright rude. Today my daughter is taking her husband to see Dr. Garcia. He's a really nice guy, and I've been recommending him to everyone. If you require a specialist one is ususally available in the same building and will see you at the same time with no need for a separate appointment and two trips to Tijuana. A lot of people, including me, have given up completely on the exhorbitant prices and less than caring attitudes found in US dentistry, and some travel great distances to have their dental work done in Mexico. They are in fact "dental tourists." You hear a lot about the high cost of medical care in the US while the high cost of US dentistry slips under the radar. It's a scandal as big as US health care, I think. I found that the Tijuana dentists I dealt with were very professional and highly competent and used the latest equipment and techniques. More importantly, they seemed to really care about their patients as opposed to a lot of US dentists who, when you open your mouth, only see dollar signs.